NORMAL ETA FOR PRE-ORDER ITEM IS BETWEEN 14 - 40 DAYS. Take a clean break with The Littles™. 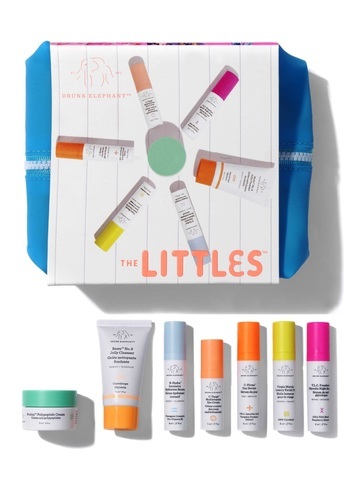 Developed to balance and reset your skin to a healthy, glowing state, Drunk Elephant's littles deliver unparalleled results when used together as a system and are compatible with all skin. Beste™ No. 9 Jelly Cleanser Squeeze Beste™ No. 9 into palm. Add water to lather and gently massage over face, eyes and neck. Rinse well with warm water and pat dry. Use nightly or in alternation with the other Drunk Elephant cleansers. Tip: We recommend skipping the morning cleanse, as it’s not necessary if you’ve cleansed your skin the night before. C-Firma™ Day Serum In the morning, apply evenly to clean, dry face, neck, chest and backs of hands. Immediately follow with Umbra Sheer™ Physical Daily Defense SPF 30 for unsurpassed UVA/UVB protection. B-Hydra™ Intensive Hydration Serum Apply B-Hydra™ to face, neck, chest, hands or any place on your body needing increased hydration. Mix with any serum, cream or oil to lock it in. Tip: Vitamin B is well-known to complement vitamin C, so try mixing it with C-Firma™ for an extra shot of hydration. T.L.C. Framboos™ Glycolic Night Serum At night, apply to a clean, dry face, neck, chest and backs of hands, avoiding the eye area. Mix with Virgin Marula Luxury Facial Oil for maximum effectiveness. Note: Very slight tingling may be experienced, particularly for the first few days of application. This typically dissipates as your skin becomes adjusted. Start slowly. Use the product every other night, alternating with Virgin Marula Oil as necessary. Virgin Marula Luxury Facial Oil Apply 2-3 drops to face, neck, chest, hands, cuticles, or any place on your body needing increased moisture or soothing nourishment, without any greasy residue. Try mixing Marula, a carrier oil, with any Drunk Elephant product to enhance penetration and results. Tip: Smooth over hair to tame frizz, nourish and add shine. Lala Retro™ Whipped Cream Apply a pump of Lala Retro™ anytime to clean, dry skin. 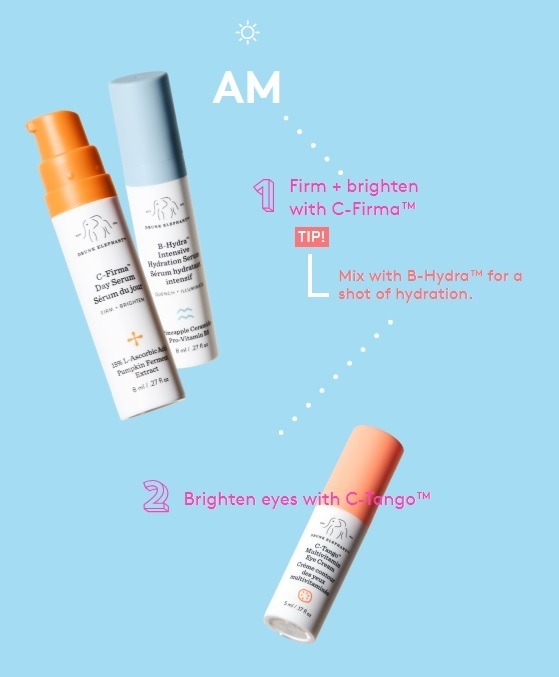 Mix with any Drunk Elephant serum, oil or sunscreen as part of a total skincare solution. Tip: Use in combination with our cleansers, serums, oil and sunscreen for a balanced, happy and healthy-looking complexion. Shaba Complex™ Eye Serum Apply with fingertip using a gentle patting motion under the eye, around orbital bone and on eyelid. May be used morning and night.